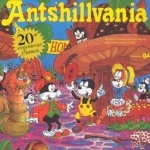 This is the first part of the Ants'hillvania, two CD set. Written by: Jimmy and Carol Owens with Cherry Boone O'Neil. Selecting the 'Buy' button will take you to 'iTunes', where these songs can be purchased!